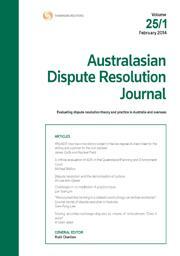 The Australasian Dispute Resolution Journal (ADRJ) starting publishing in February 1990, and this year has reached its 25th volume. Alternative Dispute Resolution procedures … fill a legitimate place in society’s armoury for the resolution of disputes. They are being recognised as part of our jurisprudence and the study of court procedures has been expanded in many law schools to cover the whole field of dispute resolution in theory as well as in practice. Over the years, contributors to the Journal have included both judges and practitioners, alongside academics in the field of Alternative Dispute Resolution (ADR). Some of our features authors include Laurence Boulle (ADR pioneer and author), Tania Sourdin (Professor, Director of Australian Centre for Justice Innovation, former head of NADRAC, leader in ADR education), Rachael Field (Associate Professor and ALTC Teaching Fellow who developed TLOs and promotes ADR in legal education), Albert Monichino (barrister, leader in international arbitration). The Journal has considered topics such as the role of judicial officers in ADR; ADR as a mandatory topic in legal education; cultural crossover in mediation; ethical practice in ADR; the role of confidentiality; co-mediation processes; the changing landscape for provision of ADR within the legal system; mandatory mediation; and the development of ADR in Asia and other international jurisdictions. In more recent years, the Journal has covered such diverse and niche topics such as mediation for the elderly; faith-based mediation; healthcare mediation and end of life decisions; ADR in prisons; Aboriginal mediation; and sports arbitral tribunals. Over the course of its 25 volumes, ADR has gone from the fringes of the legal industry to being a core part of many practitioners workload, and the Journal has evolved to reflect this development. As the Journal marks its 25th Volume, it continues to be led by General Editor Ruth Charlton, with Sir Laurence Street remaining Chief Editorial Consultant and heading up an Editorial Board of wide-ranging expertise. David Spencer, case note writer since the Journal’s inceptions, continues to write notes for every issue. For more news relating to Australasian Journal of Dispute Resolution, or our entire Journals Portfolio, stay tuned or follow us on Twitter.